A view across fields to Housesteads. Photo by Northumberland County Council. The parish of Bardon Mill is on the north side of the River South Tyne. Although the land along the river is low lying it quickly rises up to rough upland pasture through which a number of stone crags jut. Amongst this area of farming and common land a number of rare glacial lochs can be seen. These small lakes, Broomlee Lough, Grindon Lough, Greenlee Lough and Crag Lough are almost the only examples in Northumberland that have been formed by the action of glaciers scouring holes out from the underlying land surface. It is on the crags of Whin Sill, which overlook these lakes that the Hadrian's Wall runs along one of its most spectacular sections. The largest village in the parish is the small industrial village of Bardon Mill. Most of the settlements in the area are small isolated farmsteads or hamlets. The lightly farmed upland fields mean that a lot of evidence of prehistoric archaeology has survived in this parish. The lack of ploughing means that many early sites can still be seen either as upstanding monuments or cropmarks. 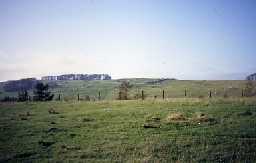 A number of prehistoric barrows, used for burying the dead in the Bronze Age, survive although no artefacts have been recovered from them. However, close to the village of Thorngrafton a fragment of a polished axe-head from the Neolithic period has been found. It is possible that such stone axes may have had some symbolic importance and they were often treated in a special manner. Other evidence for prehistoric religion in the area comes from a Bronze Age stone circle to the south of Greenlee Lough. Stone circles were probably the sites of some kind of religious ceremony, and it is uncommon to find them in Northumberland. Despite all these examples of religion and burial there is no evidence for any permanent settlements. It is possible that the rough uplands where archaeological remains survive were not farmed permanently and just used to graze animals. In the Iron Age the situation changed, and there is plenty of evidence for farming in the parish. This can be seen in several forms. In a number of places patches of cord rig can be seen. These are the slight remaining traces of prehistoric plough furrows. Elsewhere the earth banks of a field system can be seen. As well as these remains of agriculture at least two probable Iron Age settlements are known. The site at Little Shield included a number of circular stone hut circles within a stone enclosure. To the south of Greenlee Lough another stone enclosure can be seen. This seems to be next to an Iron Age field system. It is Hadrian's Wall, built by the Romans in AD122 that forms one of the biggest archaeological monuments in the parish. Several miles of the wall can be seen both as restored stone walling and earth-covered mound. On this stretch a number of forts can be seen. These include several small turrets, Milecastle 37 and Milecastle 38. Most important are the remains of the exceptionally well-preserved Roman fort and small town at Housesteads. The Romans knew this site as Vercovivium. It has been the site of much archaeological work and has produced many important archaeological finds including carved stone, pottery and other small finds. The civilian settlement outside the fort is large and even has its own cemetery and temples. The fort and the settlement probably finally fell out of use at the end of the fourth century. Virtually nothing is known of the history of the parish in the early medieval period. However, the evidence from place-names tells us the Anglo-Saxons occupied the area, as many of the place names include Anglo-Saxon words. For example, Thorngrafton means 'farm by the thorn copse' in Old English. Using this kind of evidence we also know that in the ninth and tenth centuries a number of people of Viking origin settled in the area. The name 'Henshaw' originally included the Old Norse name Hethin. In the medieval period the area was predominantly agricultural. There are a number of examples of ruined shielings, which may be of medieval date. In the late medieval period (14th to 16th centuries) the area suffered badly from raiding from bandits and reivers. This lead to the construction of many bastles, small fortified farmhouses. The remains of at least fifteen such buildings have been identified. Perhaps the best examples can be seen at Willimontswyke. These bastles are widely spread across the parish and are often in isolated positions. This suggests that most people lived in small isolated farms, rather than villages. However, a number of small villages are known to have existed in the parish, although many of them have now shrunk. Often the village centre may have consisted of only one or two farms with the other inhabitants living in outlying houses.